Consider these possible connections between Mary, the Patron Saint of the cathedral, and the labyrinth at Notre Dame de Chartres. In some discussion about the labyrinth, Mary is equated with Ariadne of the original myth. Mary, as the mother of the Church, is understood to hold the thread that keeps Christians from losing their way. Gilles Frésson links the ancient red cross on the vault high above the entrance to the labyrinth with the piece of metal (which believes is present to recall Ariadne’s thread) underneath it on the cathedral floor. See: Frésson, Gilles. Mars-Avril 1990. “A propos du labyrinthe.” Notre Dame de Chartres:16-18. Some see a correspondence in the number of stones of the labyrinth to the days of human gestation. In Chartres, this could be a subtle echo reminding pilgrims of Mary’s pregnancy with Jesus. See Roger Joly. (1999). Une Nouvelle Lecture pour Le Labyrinth de la Cathédrale de Chartres. Bulletin de la Société d’Archéologie d’Eure et Loir, 63, 202-231. Page 220 is of particular interest. In talking with both catholic and Protestant pilgrims, I have heard several mention experiencing the labyrinth as, “Mary’s breast” (le sein de Marie), a place of maternal comfort and reassurance. In medieval times the rose symbolized the Virgin Mary. “…the meaning of the petals relates…to Mary, to whom the cathedral is dedicated. One of the most elementary geometrical designs is one circle surrounded by six others, all exactly the same size, all just touching each other… Seven, then, is the relevant number with regards to petal design, even though se only see six petals. 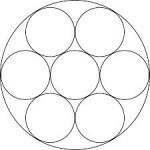 Seven, it seems, is the only number in the first ten numbers (1-10) that neither generates nor is generated by another number via multiplication. …it neither begets or is begotten. For that reason, it has been know since ancient times as “the virgin.” Seven is the number of virginity. Chartres Cathedral is dedicated to the Virgin Mary because of the great hope that she could act as intercessor and help one attain Paradise. 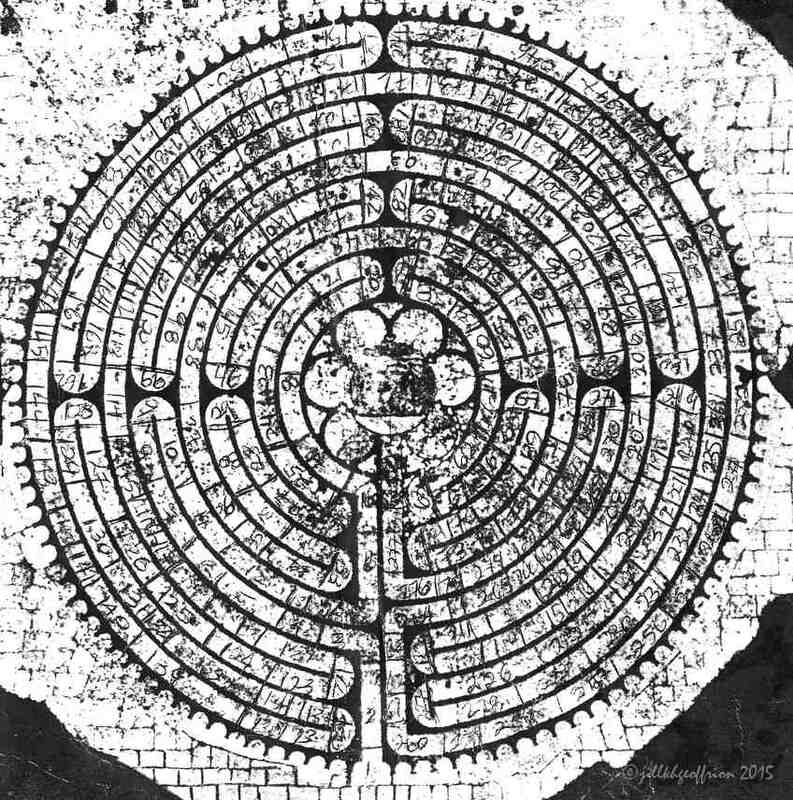 The center of the labyrinth represents Heaven, the goal of our earthly journey. The chance of arriving there is enhanced by Mary’s help and her status. It makes sense that the geometry of the petals, therefore, is based on the number of the Virgin.” Robert Ferre. Constructing the Chartres Labyrinth. An Instruction Manual. St. Louis, MO: One Way Press. (2001) 21. Images of Mary in the stained glass that surrounds the labyrinth relate to it in meaningful ways.. For instance, John and Odette Kelley-Laporte in Le Labyrinthe Déchiffré describe a relationship between the light entering the cathedral through the west central lancet window on the feast days of Mary (the Dormition on August 13, 1194 or the Asuumption on August 15th of that year) during the construction the church that determined the placement of the labyrinth and thus the geometry of the entire cathedral. See pages 63-65. “Le 22 août (qui correspond au 15 août, jour de l’Assomption, du calendrier julien utilisé au Moyen Age), un rayon de soleil relie la Vierge de la verrière occidentale au centre du labyrinthe. Or la verrière fut placée quarante ans avant le labyrinthe actuel. On notera aussi que la hauteur du centre de la rose est sensiblement égale à la distance qui sépare le labyrinthe du massif occidental. La rose, elle, fut mise en place vingt ans après le labyrinthe.” Page 64. Pheobe Griswold spoke of her experience of Mary while walking the labyrinth. “I turned toward the high altar. 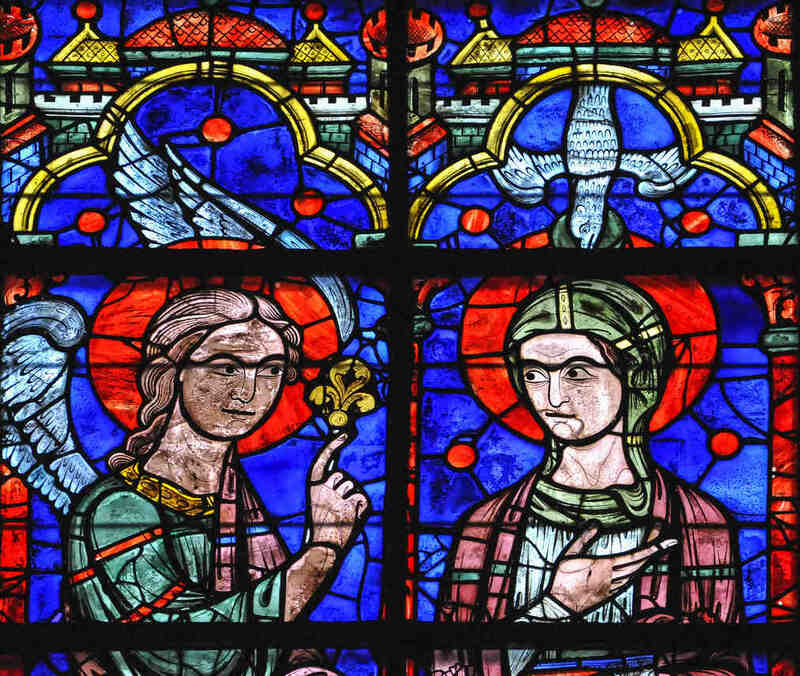 There in a window above the altar was Mary and her story, the annunciation and visitation… Mary gazed out, straight down the nave to her son at the end of the Church. Like a giant tie-rod that holds a structure together, Mary’s gift to us became vividly apparent to me. I saw what Henry Adams meant when he wrote, “It is about Mother and Son.” Reflection: The Labyrinth of Chartres. Anglican Theological Review(Winter 2001). While I am not familiar with the practice of Gematria, I pass on these thoughts from John James, the Australian Architect who has studied the cathedral extensively. See: James, John. 1982. The Master Masons of Chartres. NY: West Grinstead Publishing and 1977. 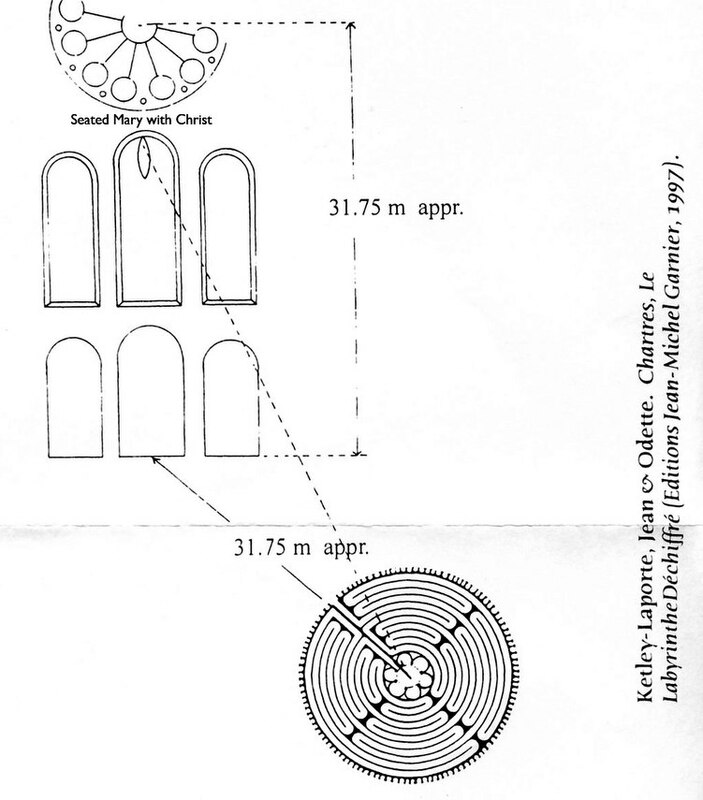 “The Mystery of the Great Labyrinth: Chartres Cathedral.” Studies in Comparative Religion 11:92-115. As the labyrinth has four quarters, each quarter plus one spells MARIA EST ASSUMPTA. This is from the ancient way divines would combine the meanings of words with the letters through a process called Gematria. In this modality each letter is given a number, starting with ‘A’ as 1, and using the 22 letters of the Roman alphabet. Adding or subtracting one from a phrase in Gematria is acceptable, as it represents unity, and therefore the godhead itself. The entry being to the left of centre there are 55 cogs on one side and 57 on the other. These two numbers spell ECCLESIA and DOMINE, while the whole including the two halves which add one cog spell both CHRISTUS and MARIA MATER DEI. The tracks and the number 35. The labyrinth has 31 curved tracks and 4 straight ones, 35 altogether. This spells BVM, which is short for Beata Virgo Maria, to whom the cathedral is consecrated. There are 28 half-round changes of direction and six quarter changes, 34 in total. This is the number of ANNA the mother of Mary, while both 6 and 28 are the first two Perfect Numbers. Together they add up to 34 which is one off BVM, and one off MV, or Maria Virgo. Half of 34 is seventeen which is the letter R standing for the Resurrection. 37 times 3 is 111, which we met earlier. Thrice is 105, which is TRINITAS, and four times is 140, or CHRISTOS EST. This labyrinth features a 6-circuit Chartres-type pattern, with a joyous poem winding through the paths, announcing Mary’s assumption into Heaven. The words “Assumpta Est Maria” (“Mary is assumed”) travel down the vertical axis of the equilateral cross, with “Est” (“is/ exist”) in the center; “Ad Caeletia Atta” (“To the Heavenly Father”) traverses the horizontal axis. The poem, part exaltation and part entreaty for favorable intervention, gives a completely new perspective on the labyrinth and its relationship to Christian spirituality. 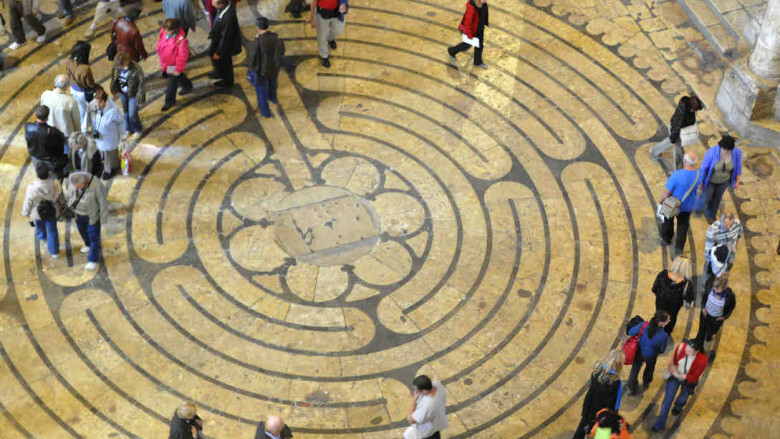 This is the first known connection of the labyrinth to Marian worship; despite the occasional presence of Ariadne, the figures associated with most other contemporary labyrinths – Theseus, the Minotaur, Daedalus, and Minos – were male. This manuscript also provides a definitive link between the concept of the labyrinth and heaven; the poem describes “the hall of the sevenfold heaven” (Kern 141), and the accompanying text claims that “wisdom has structured this city, which a sevenfold circle surrounds, and one and the same exit and entrance opens it with open approaches and closing, closes it again” (Kern 141). 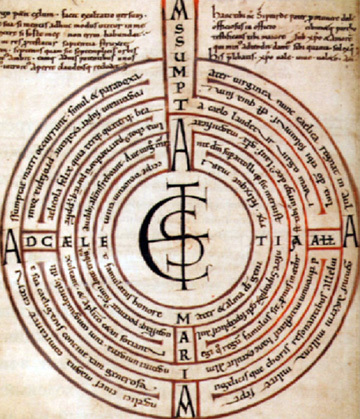 The connections between the labyrinth, Mary, and the heavenly city become even more pronounced as one delves into the symbology of the church labyrinths of the later Middle Ages. Kristin Doll, Hic Habitat Minotaurus: Transformation of the Labyrinth from Pagan Myth to Medieval Manuscripts, Page 12. Unpublished Paper. Doll, Kristin. (2003). 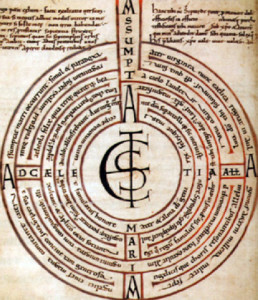 Domus Deadeli: Elements of Sacred Symbolism in the Labyrinth of Chartres. Unpublished paper. Includes an in-depth discussion of Mary, the labyrinth, and the heavenly city. Doll, Kristin. (2003). Hic Habitat Minotaurus: Transformation of the Labyrinth from Pagan Myth to Medieval Manuscripts. Undergraduate Paper for Literature and Religion (U of Minnesota, Prof. Stephen Daniel). Literature. University of Minnesota. Unpublished. Dubosc, Georges. Première parution dans le Journal de Rouen du 5 avril 1920 sous le titre : Le football de Pâques dans les églises du Moyen-Age. Texte établi sur l’exemplaire de la médiathèque (Bm Lx : norm 1496) de Par-ci, par-là : études d’histoire et de moeurs normandes, 3ème série, publié à Rouen chez Defontaine en 1923. Ferré, Robert. (2001). Constructing the Chartres Labyrinth. An Instruction Manual. St. Louis, MO: One Way Press. Frésson, Gilles. Mars-Avril 1990. “A propos du labyrinthe.” Notre Dame de Chartres:16-18. Griswold, Pheobe W. (2001). Reflection: The Labyrinth of Chartres. Anglican Theological Review(Winter 2001). Joly, Roger. (1999). Une Nouvelle Lecture pour Le Labyrinth de la Cathédrale de Chartres. Bulletin de la Société d’Archéologie d’Eure et Loir, 63, 202-231. Kern, Hermann. (2000). Through the Labyrinth. Designs and Meanings over 5,000 Years. New York: Prestel. Ketley-LaPorte, John & Odette. (1997). Chartres: Le Labyrinthe Déchiffré: Éditions Jean-Michel Garnier.